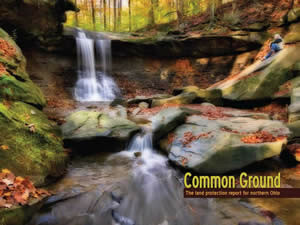 The first comprehensive examination of land conservation in northern Ohio has determined that about 7 percent of the area, or 295,322 acres, in a 14-county region has been preserved – significantly less than the 10- to 15-percent level recommended by local experts.In addition, Common Ground: The regional land protection report for northern Ohio found that 5 percent of the region’s farmland is now protected, meaning that 95 percent of the existing agricultural land – property containing some of the world’s richest soils – could be lost to development. The report was a collaborative effort by local land conservancies, park systems, community leaders, outdoor groups, soil and water conservation districts, property owners and nonprofit organizations. It was coordinated and funded by Western Reserve Land Conservancy, a Moreland Hills-based nonprofit, with additional support from the Alton F. and Carrie S. Davis Fund and the Sandra L. and Dennis B. Haslinger Family Foundation. 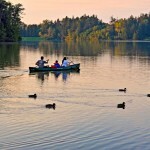 “We received tremendous cooperation from the conservation community here in northern Ohio, and knowing where we stand today, in terms of preserved land, should help us understand how to make our region an even better place to live, work and play in the future,” said the Land Conservancy’s Liz Mather, who co-authored the report with fellow staffer Ken Wood. The report’s authors and advisory board members hope the document can become a tool for the entire conservation community in discussions about land preservation in the region. The report used data and other information from more than 60 sources ranging from park system databases to interviews with farmers. The goal was to document, for the first time, the state of land conservation in northern Ohio and to analyze the information for use going forward. Counties in the study area were: Cuyahoga, Lorain, Lake, Medina, Summit, Geauga, Erie, Huron, Wayne, Stark, Portage, Mahoning, Trumbull and Ashtabula. Overall land preservation: Seven percent of all land in the 14-county study area – 295,322 acres – has been permanently protected. In a survey of local conservation partners, 92% of the respondents said the minimum goal for preservation should be 10%; more than two-thirds believed the standard should be 15%. Rate: The region is now preserving land at a rate of about 1% per decade, meaning that at the current pace it would take 30 years to protect 10% of our land and 80 years to reach the 15% level. Loss of farmland: Northern Ohio is blessed with prime soils, but the number of farmland acres in the study area has dropped to less than 1.5 million – less than half the agricultural acreage we had in 1935. More productive land is at risk: Ninety-five percent of the farmland in the study area is not protected, meaning it could one day be developed for houses or businesses. Sprawl: While sprawl has been slowed by a diminished housing market, it remains a threat to the region’s health. Northern Ohio’s population has declined since peaking at 4.2 million people in 1970, yet we have continued to develop 8% more of our land, according to land cover surveys. A prime example of sprawl’s effects is Cuyahoga County, which went from being semi-rural in 1950 to completely developed in 2000 – while its population remained essentially unchanged. Nearby parks: Nearly 28% of our region’s residents live within what is considered a “walkable” distance – ½ mile – from a park or other protected land. More than half the people living within our cities are within that distance. Shale challenge: Oil and gas drilling in the Utica Point Pleasant formation is one of the largest forces ever faced by the land conservation community in northern Ohio. The response to this force will largely determine whether we can increase the pace of land protection, minimize potential impacts on our most critical natural resources and improve the quality of life in our region. Rare species: The Natural Heritage Database for our region lists more than 400 unique species, including 16 known federally endangered species and 41 known federally threatened species. Sixty-seven percent of the 3,376 natural heritage records – known locations of rare plant and animal species – for our region occur on park, protected or managed land. Conservation options: Many people have a clear understanding of public land protection as it pertains to parks and preserves. There is less understanding about other methods of private land protection, such as conservation easements and deed restrictions – and the power the landowner has in crafting these tools to meet his or her needs. Urban neighborhoods: Re-using the vacant land opened up by home demolitions will be critical to the revitalization of our urban neighborhoods. Thousands of vacant and abandoned homes in our region need to be demolished, and their existence today threatens the health of our cities. According to figures from Northeast Ohio Community and Neighborhood Data for Organizing, there were 121,429 vacancies in our study area – nearly 6% of the total addresses – in our region during the first quarter of 2012. This is up from 88,181 vacancies (4.46%) in the same quarter of 2006. Public funding issues: Federal funding for land preservation is important but has not kept pace with the need. Spending on land, water, and wildlife programs comprises just 1.26% of the federal budget and has grown just 2% over the last 30 years. Federal funding for programs that support land conservation has decreased overall during the last five to 10 years, although some individual programs have seen an increase. Emerging initiatives: There are innovative land-use programs in our region that will bear watching as we move forward. These include the Countryside Initiative, which focuses on rehabilitating and revitalizing the old farms within the boundaries of the Cuyahoga Valley National Park; the various urban farming opportunities that have cropped up throughout northern Ohio; Thriving Communities Institute, which is helping counties establish land banks; and The Oberlin Project, a wide-ranging initiative that includes land conservation and the creation of a robust local foods economy. The report concludes that “the window of opportunity for preserving the best of our region’s natural resources is closing fast. It cannot be reopened. Coordinators plan to do this study every three years, with updates annually. Single copies of the report are available by calling Western Reserve Land Conservancy at (440) 528-4150. Conservation groups interested in a presentation about the report can also contact the Land Conservancy. Connect with our partner organizations, browse our publications, get news or learn about everything from conservation easements to county land banks.